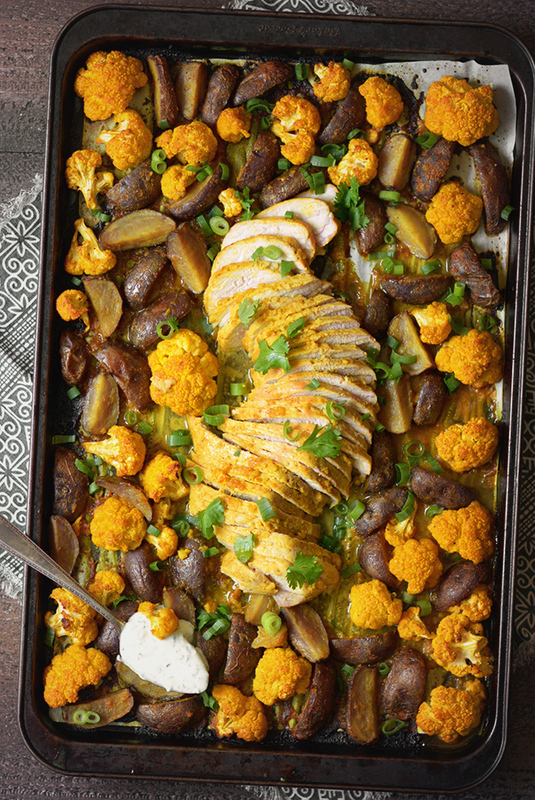 Curried Sheet Pan Pork Tenderloin with Potatoes and Cauliflower – This delicious sheet pan recipe combines exotic flavors, dead simple preparation, and easy cleanup to create a weeknight culinary masterpiece! 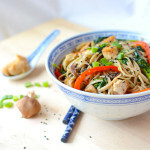 Is anyone else always on the hunt for quick and easy meals that are healthy and aren’t boring. I know I am! Between work and the kids it’s seems like, on any given night, easy meals with minimal clean-up are a MUST. Even with the busyness of life, the foodie in me doesn’t want to get lost in a haze of Easy Mac, chicken nuggets, fish sticks, and freezer burnt bags of vegetables. I still want to make my family tasty and healthy meals. That’s where my love of sheet pan meals has, I guess you could say “blossomed,” over the last couple of years. 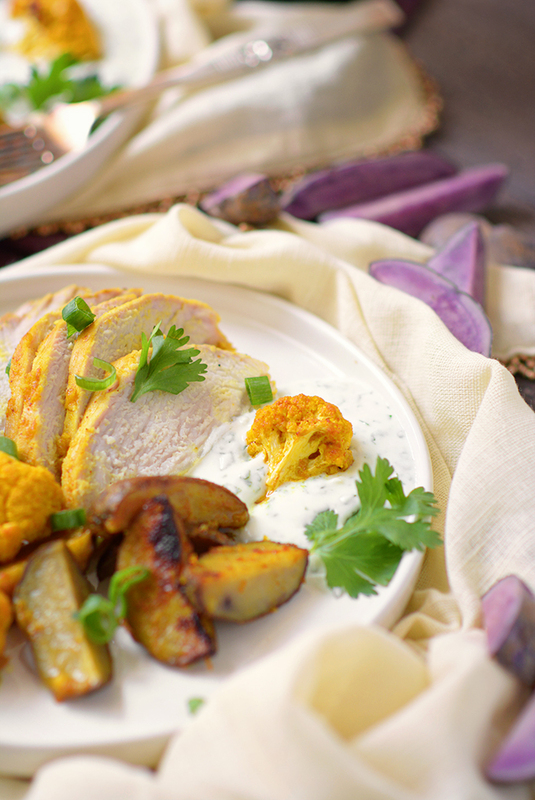 My recipe for Curried Sheet Pan Pork Tenderloin with Potatoes and Cauliflower was a huge weeknight hit in my home! It’s spicy (but not too much) and savory. 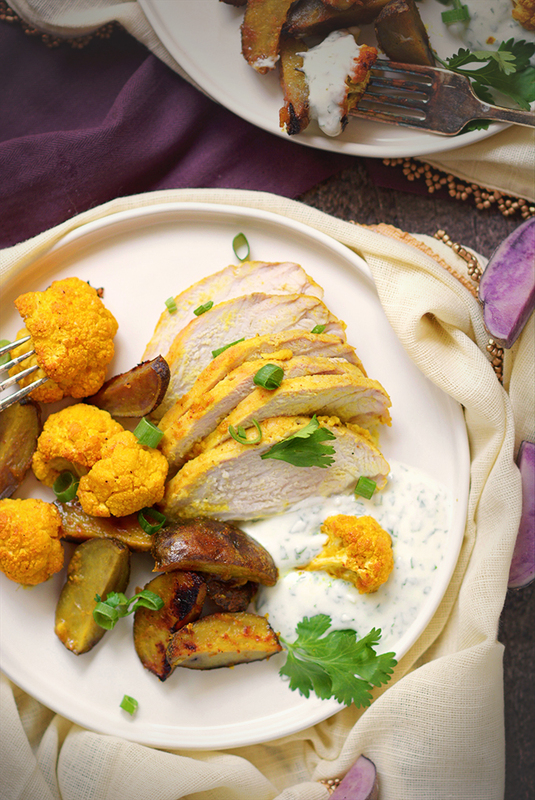 I also decided to make things a bit more fun by using purple potatoes and orange cauliflower. 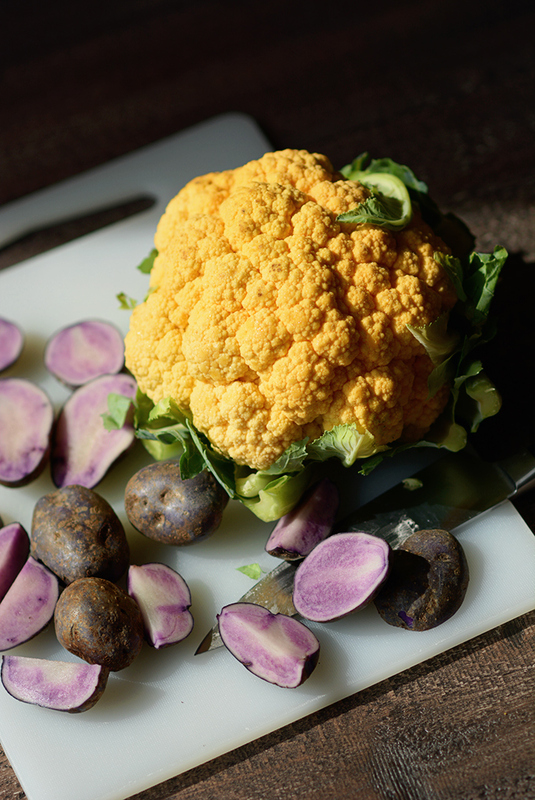 Now, I’ll let you in on a little secret: they taste the same as regular potatoes and cauliflower, but the more colorful varieties are obviously more fun! This recipe takes the shake-and-bake approach, which means not a lot of prep and less dishes. 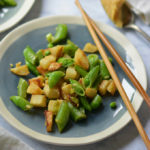 It’s hard to believe that something so simple makes such a flavorful weeknight meal! 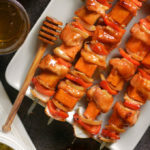 Mix together the vegetable oil, lemon juice, honey, curry powder, ginger, garlic, salt, and pepper to create your marinade. Separate out ⅓ C of the marinade and place it in a ziplock bag with the pork tenderloin. Allow the pork tenderloin to marinate for at least one hour. Meanwhile, prep the potatoes and cauliflower and coat it with the remainder or the marinade. Preheat the oven to 400º F and line a large baking sheet with parchment paper. 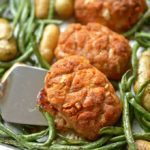 Arrange the sheet pan with the pork tenderloin in the middle and the vegetables around it. Roast for 25-35 minutes or until the pork tenderloin reaches an internal temperature of 145ºF. When the pork tenderloin is done cooking let it rest for five minutes and then cut into slices. 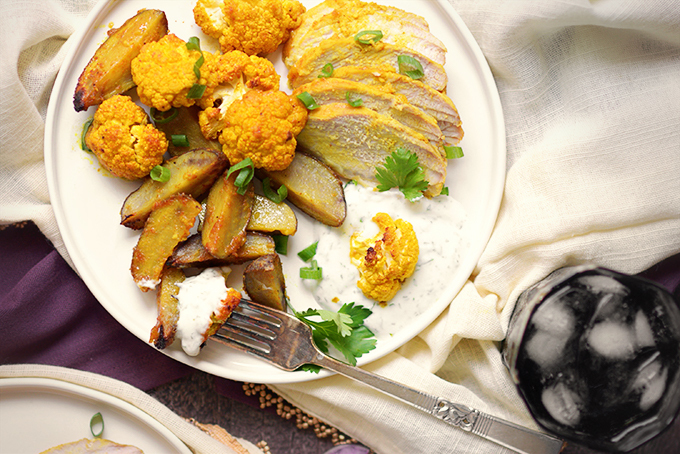 Serve with the potatoes, cauliflower and yogurt dipping sauce. 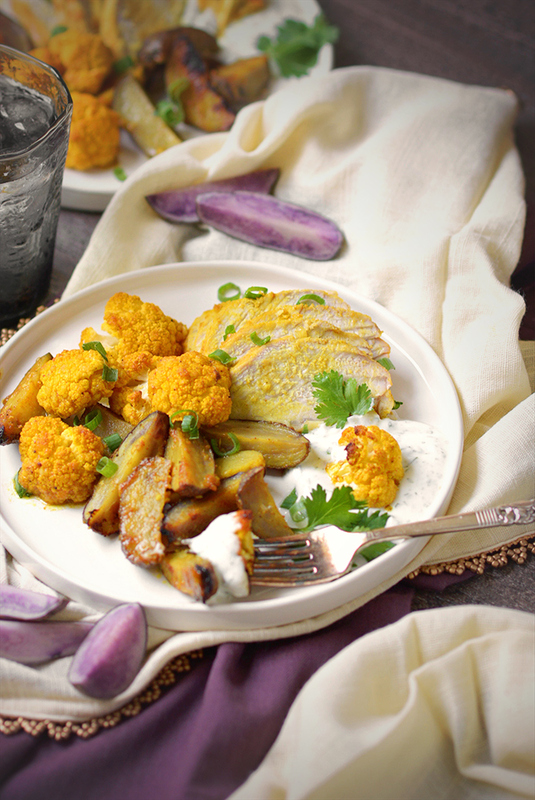 *I used purple potatoes and orange cauliflower for the fun of it, but red potatoes and any color of cauliflower, whether it be orange, purple or white, will work with this recipe. 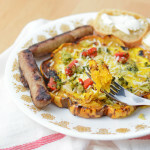 This is a perfect way to have a delicious colorful dinner ready in no time! 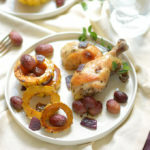 I had a hard time finding the purple potatoes, but loved how beautiful they were on the plate with the super moist pork! Thanks for sharing! Sorry you had trouble finding the purple potatoes, but honestly, they’re just for looks! Other potatoes work too! Thanks for letting me know you enjoyed this recipe! This looks like a filling and tasty meal! YUM! I simiply love one-sheet pan recipes but yours here goes beyond convenience. The colors are so ver pretty and inviting. The combination of ingredients really sound delicious. This is one recipe to save. Thanks Marisa! I was going for colorful! I also love love love sheet pan dinners! They are such a staple in our house — I’ll prep everything the night before, leave the sheet pan in the refrigerator, and when I’m on my way home from work my husband will pop it into the oven and it’s ready for us to sit down and eat as soon as I walk in the door. Can’t wait to try this curried pork version! That’s such a good plan! I work weekends during which time my husband holds down the fort, including the kitchen. I’m totally going to steal your pre-making the sheet pan dinner idea for on those days! Sheet pan meals are amazing – but when you make them super flavorful like their they are even better! LOVE he curried pork here! Thanks Jenni! Life is always better with a little added spice! 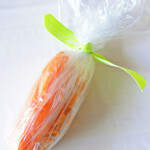 I recently became a mom to three so easy recipes with minimal cleanup make it into my rotation far more than they used to! 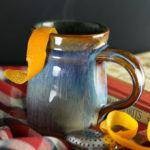 This is perfectly up my alley and I can’t wait to make it! Plus, I love the fun colors! Congratulations on the new baby! My second child recently turned one so I know how hard it is to get dinner on the table that first year. Thus all the one-pot and one-pan recipes on my blog as of late! Happy cooking and mostly happy snuggling with your new little one! One of my weeknight favorites for a quick dinner just happens to be roasted cauliflowers with some salt and cayenne pepper and they are so good, but it’s such a good idea to update that with some sweet potatoes! I’ll definitely be trying this! I’m all about simple meals these days. Spending less time in the kitchen and more time enjoying my quickly growing kids is actually one of my goals for this new year! Your recipe is just what I’ve been looking for! Thanks for sharing! I’ve also been embracing more of the one-pot and one-pan meals over the last year in order to spend more time with the kids! Best of luck on your New Year’s goal! 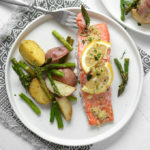 I’m always looking for new “one-pan” meals and this one looks great. I have some pork tenderloin in the freezer, looks like this is going to be dinner tomorrow. I’m happy this was what you were looking for. Enjoy! This looks like a perfect family meal! I can’t wait to try your recipe! Thanks Sara! My family devoured it!